In defense of Scott Lobdell and Brett Booth, they were asked to recreate the most famous team of sidekicks and legacy characters in history in a world that no longer has sidekicks or legacy characters. 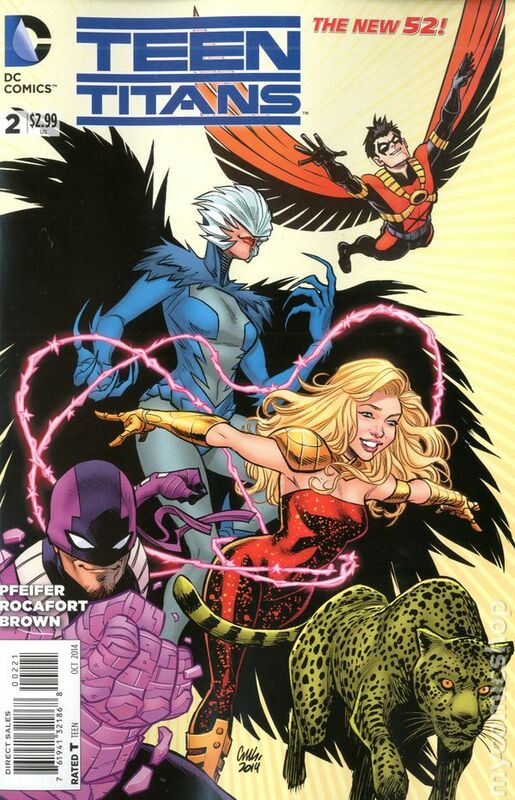 More so perhaps than any other New 52 book, the “Teen Titans” had to be drastically different. The initial concept is actually pretty good, all things considered. There are teenagers with superpowers running around and no one seems to be in charge of them. That’s not an unreasonable situation. Marvel may have done away with the Super Human Registration Act, but you’d think someone would make an issue of minors fighting crime. Of course, there are bad guys sweeping up all the kids with powers, so someone has to rescue them. And that someone is Tim Drake aka Red Robin. We should probably get this out of the way right now. For all the weird and awful and stupid decisions DC has made with the New 52, the changes made to Tim Drake were the worst. They were, in fact, the biggest obstacle between me and the current DCU. Tim Drake was Robin. It said so in Batman #1, it said so in Teen Titans #1, it even said so in Teen Titans #8. That was eight months down the line when it was still okay for Tim Drake to have been Robin. But at some point, someone decided to do something stupid. Someone decided that Tim had always gone by the name Red Robin, and was more of a partner to Batman than a sidekick. Maybe they thought limiting the number of people who have been Robin to three makes it feel less white male-y. It’s not that we only pick white guys, it’s that we’ve only had three! Does one more really tip the scale? Or was this change really made because DC felt bad for erasing the only Robin that wasn’t a white dude? When you retcon something that just happened, you must be serious about it. Thankfully, Rebirth has brought Tim’s original origin story back, thank god. Anyway, the guy named after a chain of hamburger joints locates Wonder Girl, who has no connection to Wonder Woman. So why is she called Wonder Girl? Because she has powers and breasts? And vaguely Greco Roman origins? This is the New 52, so of course this version of Wonder Girl has attitude — and don’t call her Wonder Girl. RR and WG are eventually joined by Skitter, the bug monster, named Skitter because cool superhero names are so last reboot. They also meet Bunker, who is from Mexico, which is a country, yet he constantly says it’s where he’s from, as if the entire country is his home town. It’s not unlike referring to Africa as a country. We meet Kid Flash, who appears to be more or less the same character as he was before the relaunch, just without any connection to the actual Flash (even his name is changed eventually). 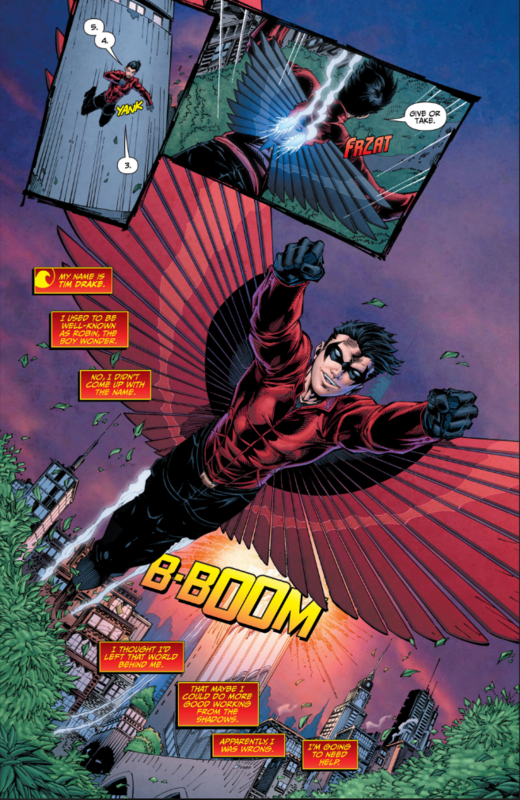 He joins up with Solstice, who originally appeared at the end of the last series, and the two eventually join up with Red Robin’s fledgling team. They are brought to RR and company by Danny the Street and, yes, Lobdell using a Grant Morrison creation felt as wrong as you would think. The bad guys aka N.O.W.H.E.R.E., send their super weapon after the team: a clone named Superboy. He eventually switches sides, of course, but not until everyone gets captured and we meet like a dozen new characters before the main ones are fleshed out at all. Over the course of the first year, the team faces off against guys named Harvest, Grymm, and Diesel, so if the art didn’t tell you this was a title built for the 90s, that probably did. I could go on and on about how this series doesn’t contain anything that made the Teen Titans special, but that’s ultimately secondary to the fact that it just wasn’t very good. It was a mediocre superhero book that placed its emphasis on plot and surface character traits instead of really digging into the characters and giving us reasons to like them. They’re left so empty, in fact, that we’re forced to fill them what we already know of the characters, which ends up being at odds with what little we do see on the page. The New 52 version of the Teen Titans doesn’t cry out for a second series, but apparently DC thought they should have another shot. 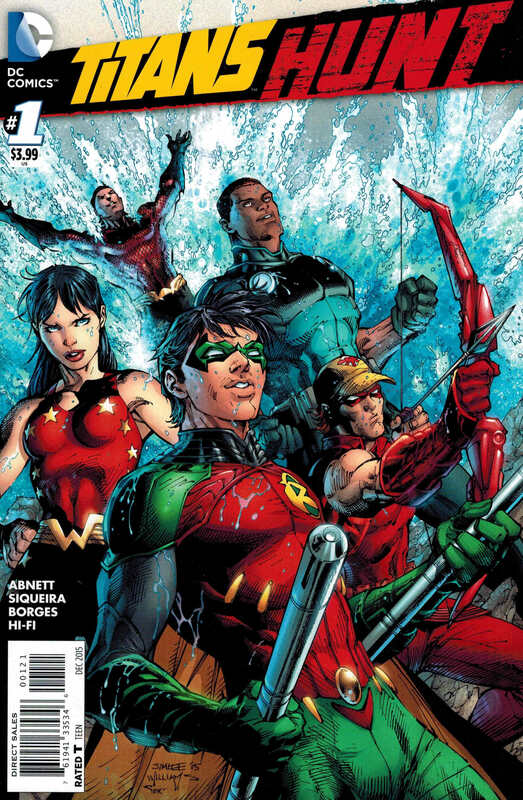 With so many series under their belt, it’s amazing that each Titans relaunch has managed to feel like a relaunch; every new #1 featured a substantially different team, so it always feels like a new beginning. Look at the change from the first Teen Titans series to New Teen Titans, or from The Titans back to Teen Titans. Big changes happened since we last saw our favorite characters, and that’s reflected in the line-ups. The new book launches with roughly the same group that ended the last series: Red Robin, Wonder Girl, Beast Boy, Raven, and Bunker. Raven is even still wearing her horrible costume from the last series. The series can be broken out into three parts based on whoever was writing the book at the time. 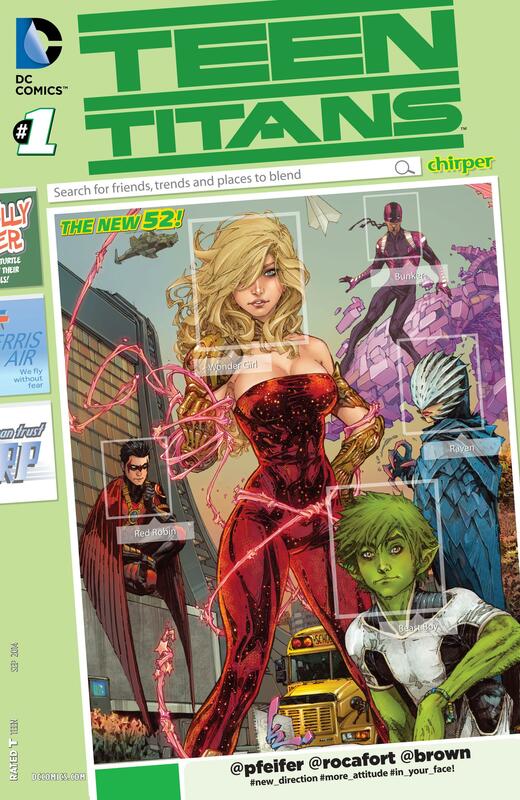 Will Pfeifer’s run features a lot of other old and new Teen Titans and even brings Ladytron into the New 52 DCU. The best thing about his run is that he added the new Power Girl to the team. She’s a great character who is the perfect addition to the team. I honestly wish she got more screen time, although she gets a brief time to shine later on. Greg Pak takes over the writing duties for a single arc which finally gives Wonder Girl a reason to be Wonder Girl. Ian Churchill comes on board as semi-regular penciler which improves the book drastically. Tony Bedard is the last writer to work on this volume. I don’t know if he knew he’d only get a half full of issues before the book ended, but he does a great job of solidifying the line-up and making them into a real team. Unfortunately, Tim Drake dies in the pages of Detective Comics and without Red Robin the team falls apart. The series ends with the characters going their separate ways and a sign that the current Robin, Damien Wayne, will soon be forming his own Teen Titans. 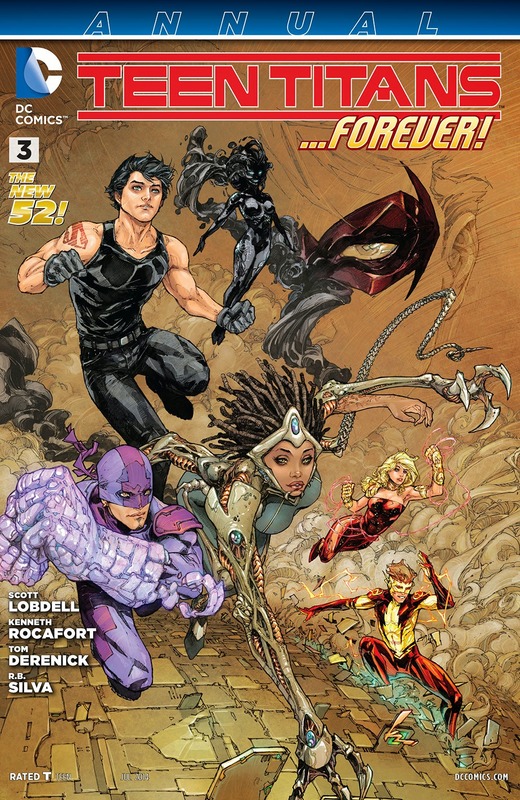 If a team calling themselves the Teen Titans was going to be problematic in the New 52, imagine the problems that the adult former Teen Titans would cause. Do they know each other? How? And if even if they could have been a team, how would that work when one of them — Wally West, Kid Flash — had been erased completely? The solution was Titans Hunt, a perfectly named series that cashed in on Titans nostalgia just with its title. I’m a sucker for books like this. I love continuity. I think the idea that people don’t read comics because they are steeped in decades of story is stupid. Part of the reason I was sucked into the world of superhero comics is because they offered endless stories for me to dig into. I loved not knowing everything in one issue. Hell, I loved not knowing everything after multiple issues. Discovering new aspects of that long history is what made it so exciting. Writer Dan Abnett does a deep dive on Titans history, pulling in characters like Gnarrk aka Caveboy, an actual Caveman, Herald (perhaps the only superhero with a woodwind? ), Bumblebee, and Hawk and Dove. The main bad guy is Mister Twister, the villain Kid Flash, Robin, and Aqualad fight in their first team-up back in Brave and the Bold #54. Since this is a prelude to Rebirth, the real bad guy is Dr. Manhattan, but we don’t know that yet. We do know that someone is giving Twister is marching orders. 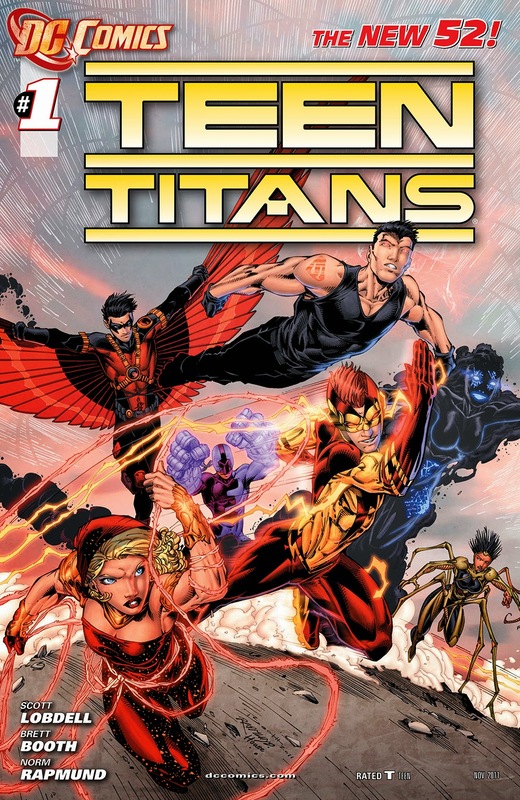 Whether or not their origin has changed is TBD, but at one point early on the Teen Titans consisted of ten characters: Kid Flash, Robin, Aqualad, Wonder Girl, Speedy, Gnarrk, Lilith, Herald, Hawk, and Dove. None of them remembers any of this, but they get their memories back over the course of the series. Well, almost. Twister mentions that there were ten of them when he fought them and they lost their memories (intentionally, as it happens) and while the nine Titans remember the events of that night, they have no idea who the tenth Titan was; they still don’t remember old school Wally West, Kid Flash and eventual Flash.